To develop effective older adult physical activity interventions, it is important to understand factors that predict participation and adherence. As the influence of technology continues to increase, those interested in promoting physical activity should consider developing physical activity programs that effectively use technology. Developing Effective Physical Activity Programs emphasizes the move away from a one-size-fits-all approach to physical activity interventions by providing evidence-based recommendations for designing, implementing, and evaluating more effective and appropriate physical activity interventions for diverse populations. 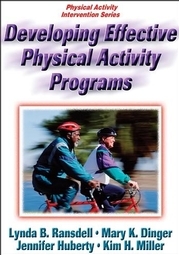 Developing Effective Physical Activity Programs emphasizes the move away from a one-size-fits-all approach to physical activity interventions by providing evidence-based recommendations for designing, implementing, and evaluating more effective and appropriate physical activity interventions for diverse populations. Part of Human Kinetics’ Physical Activity Intervention series, the book provides research, methods, techniques, and support to health professionals seeking ways to promote physical activity programs that meet the specific needs of women, overweight and obese populations, older adults, and ethnically diverse populations—those shown as most likely to be sedentary and in need of the benefits of physical activity interventions. The final section of the text examines how the built environment, setting, and technology can influence intervention planning. You’ll look at the ways in which neighborhood and community design can affect a person’s physical activity levels. You’ll also consider the various settings in which a program can be held, including homes, churches, and worksites, and how those settings will affect your program. This section also shows you how technology, such as Web- and phone-based interventions and podcasts, can be used to expand the reach of your program and positively influence the physical activity levels of participants.